Yeah, I know, it's a bit weird. Hotel Chocolat's cocoa penne. I was browsing in my local Hotel Chocolat (and schnaffling up the free samples) when I saw this and knew I had to try it. It's pricey stuff, at £5 for 250g - but for a special occasion it's kind of cool. The taste of it, once cooked, is more like the flavour of hot chocolate I suppose rather than dark, proper chocolate, and although I'd been told on Twitter by @swcfood that it went well with tomato and chilli sauce, I decided to try something sweet with it. The cocoa pasta is unsweetened, which is worth remembering because the whole dish here doesn't taste as sweet as you expect it to. The vanilla seeds in the mascarpone lend a musky sweetness, and coat the penne. 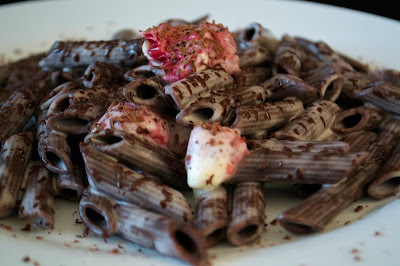 The raspberries add a tartness to the whole thing, and then I finished off the pasta with a grating of a Parmesan equivalent: dark chocolate. Cook the pasta in boiling water for about 10 minutes, until cooked. Meanwhile, combine the mascarpone and vanilla seeds in a bowl until the cheese is evenly freckled, and dump in the raspberries, whole. Drain the pasta and immediately toss it in the mascarpone mixture. Serve, with some more dark chocolate grated over the top. 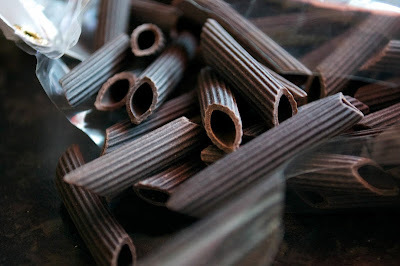 Have you tried cocoa pasta? What do you think works best with it? What did you think of it? Not sure I would be brave enough to try this pasta! It does look very interesting though and I love how you've used a sweet recipe with it.